How would you react if you couldn’t be seen or heard? Eliza is struggling to work out why no one in her rural church community will listen to her. Their fears, feelings and good intentions may be the prime suspect, or maybe it’s just her dementia? Eliza needs the local detective to hear her before it’s too late. 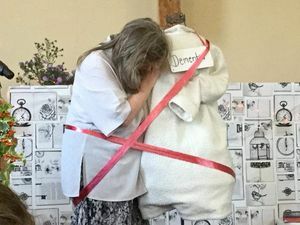 The Disappearance of Eliza Grey is an entertaining full-length play, exploring why people with Dementia can become invisible and how to enable them to live well. 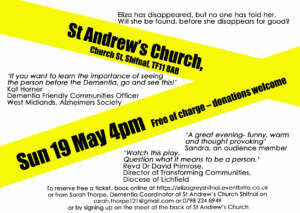 It supports the Alzheimer’s Society ‘Dementia Friendly Community’ initiative. Kat Horner, Dementia Friendly Communities Officer, West Midlands, Alzheimer’s Society. 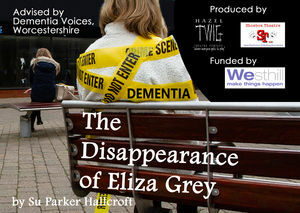 The Disappearance of Eliza Grey is a coproduction with Hazel Twig Theatre Company and Shoebox Theatre CIC. 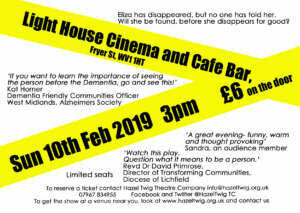 Hazel Twig Theatre Company is run by Su Parker Hallcroft who has lived alongside dementia through caring for her dad and now works on dementia-friendly churches as a Dementia Enabler in The Black Country for the Diocese of Lichfield. This has led her to write and perform in "The Disappearance of Eliza Grey". Su is also a director of Shoebox Theatre who work to make intergenerational theatre that is accessible to everyone. Can I book the show for my venue? The show is available to book at any time, and can easily fit in most venues. If you have somewhere that the show can be seen at please email Hazel Twig. If you are a Church, Local churches have devised an innovative called ‘pay the play forward’ scheme. Audience can see the play for free, as another church has paid for their play, but audience members are then asked to donate for the play to be seen at the next church, and so on. Please get in touch if you want to find out more about this. Where can I see the play? Thanks to the Westhill Endowment, the show initially toured in Oct- November 2018 around Staffordshire, with some bookings into 2019. 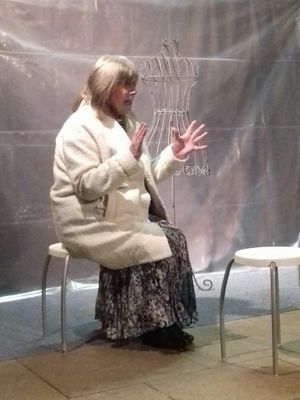 Also Westhill Endowment have enabled the play to be performed in a short tour in venues round Staffordshire and to be filmed so that those booking for other venues can see the play beforehand if they require. To find out more about the play www.hazeltwig.org.uk. 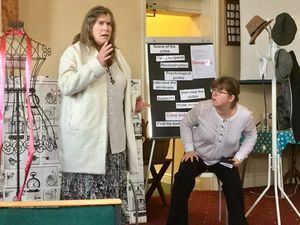 We would love to get the play seen by more venues and used in a workshop environment for training.